I want to share with you a mindset for successful people from my most successful Client Mindset Number 1, which is the first one, and it is Cause and Effect. It seems to be a little bit of a law in the universe that, when anything actually happens in the universe, there's always something which caused it or created it in the first place. You don't just have things happen haphazardly without something creating it in the first place. Now, the question is, then, as far as that equation is concerned, which side of that equation are you on in your life? Are you on effect, of someone or situations, circumstances and other people, or are you the creator of the things that happen in your life? Successful people tend to live on the core side of the equation, in that, when anything happens to them in their world, in their universe, in their circumstances and situations, well, they tend to ask themselves, "So, how did I create this, and what do I need to do differently to create something differently in the future? What is there for me to learn about this particular event, and from this particular event, the learning of which will enable me to create things that I want to create next time around?" Now, how far do you decide to take this particular belief? Well, the further you take it, the greater results that you will create. So, one of my challenges to you over the next few days, week, is to begin to operate from that mindset and think that everything that you experience is somehow your creation, whether you consciously and deliberately created it or not. And ask yourself, "Okay, so how did I create this, and what do I need to do differently next time to create it differently?" So why would you want to put yourself over on the cause side of the equation? Well, think about it. If you think about choice, for instance, then if you're in the effect side of the equation...so what you're experiencing in any particular time is the creation of somebody or something else, then, effectively, you're stuck with that. So here's an example. I was working with a particular business, and one of the things they said to me was they weren't achieving their sales goals. So I said, "How do you do that?" And they said, "Well, it has nothing to do with us. It has to do with the exchange rate between the pound and the dollar." 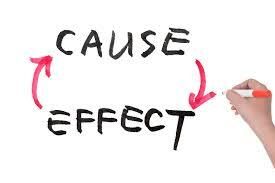 Which side of the cause and effect equation do you think those people are on? Well, of course, they're on the effect side of the equation because they're saying the results that they're creating, the results that they're experiencing in their life, actually are due to something outside of them, actually something outside of their control, as in the exchange rate between the pound and the dollar. So now what do they need to do to be able to achieve their goals? Well, there isn't anything they can do. They just need to sit there and wait for the exchange rate between the pound and the dollar to change in their favor. Let's think about it the other way...somebody who's a cause for the results that they get themselves. So you've got certain sales targets that you're not actually achieving at this particular point in time. So the people on the cause side of the equation will say to themselves, "So how am I creating, not achieving, my sales targets, and what do I need to do differently such that when I do differently, I will achieve my sales targets? What is there for me to learn about this particular situation, the learning of which will enable me to achieve my sales targets?" Now we have somebody who's at choice. So when you're at the cause side of the equation, there will always be something that you could do to improve the results that you're creating. If you're on the effect side of the equation, there's never anything that you can do to improve the results that you're creating. Here's another example. I was working with a trainer who trained people that worked on oil rigs. And one of things he said to me, "Well, the problem is Dr. Luke, everybody who works on oil rigs are quite thick, as in they're stupid. They don't learn very well." And I said, "Oh, okay. Well, that's interesting." I've met people who work on oil rigs, and I found them to be very intelligent and bright people. That's why they work on oil rigs. And certainly a lot of them were significantly bigger than me. And I certainly won't say that they were thick from a personal safety point of view. But this guy actually believed that all people on oil rigs were thick or stupid. And I said, "Well, how do your trainings go?" And he said, "Well, they always go badly. They never get it." You see, he is actually taking the result of his training that he's creating, and putting all the responsibility on the students because he actually has a belief that they won't get it. So without being aware of it, he's actually creating a situation where they don't get it on his trainings. So really, what we're talking about here is empowerment. I hear the word empowerment mentioned more and more and more in recent years, but I don't tend to see that much of it going on. So how do you empower yourself? Or simply, empowerment is moving from the effect side of the equation to the cause side of the equation.